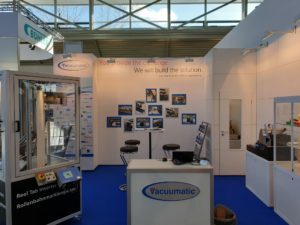 vacuumatic takes the first order at the print show 2018! We had the honour to be the first exhibitors to make a sale at The Print Show 2018. With the sale of two of our fantastic Vicount 3 Paper counting machines to Harlow Printing in South Shields. Below is what Print Business magazine wrote about us in their November/December 2018 issue. 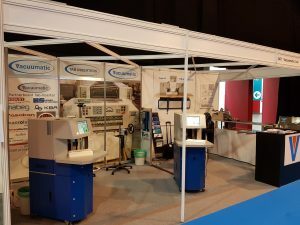 Clean counting adds up: HARLOW PRINTING, South Shields, had the honour of placing the first order of the Print Show, signing for two Vacuumatic machines before noon on the first day. The two Vicount sheet counters will ensure that what is shipped to customers is precisely what they have ordered. 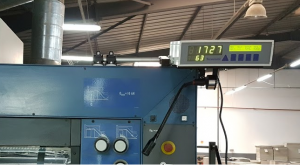 With shorter runs and a focus on reducing waste, represented by printing too many overs, being able to accurately count what goes out, becomes an essential facet of the lean manufacturing strategy. The counting machines earn their keep at the other end too. Vacuumatic was able to demonstrate that what a printer had received in a ream from the paper supplier had only 497 sheets, the next ream 498 and so on through hundreds of reams of paper. Each fell a few sheets short, culminating in a significant shortfall on what was ordered. This short excerpt pretty much sums up the great benefit the Vicount 3 range of machines offers to our customers. If you need to ensure 100% accuracy on what is delivered to your customers, then the Vacuumatic Vicount 3 is the machine for you. 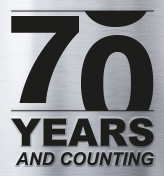 After 67 years of experience and success, you can count on us! We are exhibiting at the print show at the nec birmingham september 18th – 20th 2018. You will be able to find us on Stand No: P30. We will have a great range of machines on show. With our Vicount 3 ‘Pin and Blade’ paper counting machine, our Vicount 3 ‘Disc’ paper counting machine, our versatile Thickness Compensating Feeder (TCF) variable thickness counting and batching machine and our range of tab inserters that includes the VUTI2, CUTI2 and MTI. Also at the show this year we are demonstrating the RTIS3 web marking/flagging machine for reel to reel flexo printers, web printing, laminators, foiling machines etc. If you are attending the show, why don’t you come over and see us. We will be more than happy to show you any or all of these great machines. Did you know we have a Finance Option for our UK Customers? Also another great advantage is that lease rental is 100% tax deductable and your capital investment does not become a depreciating asset. If you would like a finance quotation for one of our machines please inform us when enquiring about our machines when you use the request a quote button. We are very pleased with the number of people visiting us at this show, and are looking forward to welcoming many more today and tomorrow. Please pop by to say hello to Alan and Dan who will be happy to demonstrate our machines and answer any questions you may have. We are now also exhibiting at print 2017 in chicago usa and the Print Show in the uk. In addition to the extensive list of shows that Vacuumatic is exhibiting at in 2017, we have added a couple more! In the USA we are exhibiting at Print 17 (10-14 September 2017). You can find us on stand No:1663. 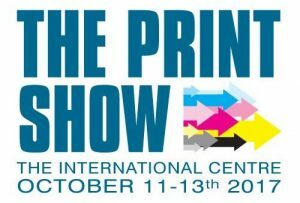 For the UK we are exhibiting at The Print Show 2017 at the International Centre in Telford (11-13 October 2017). You can find us on Stand No: A01. 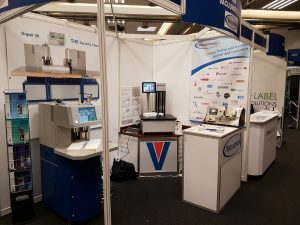 At both shows we will demonstrating our Vicount 3 ‘Pin and Blade’ paper counting machine, our Vicount 3 ‘Disc’ paper counting machine, our versatile Thickness Compensating Feeder (TCF) variable thickness counting and batching machine, our Count-S optical counting machine and some of our Tab Inserter machines. If you are attending either of the shows, why don’t you come over and see us! We will be more than happy to show you any or all of these great machines. There was great interest in our machines at SDW 2017. With plenty of delegates viewing our machines between conferences, some from as far a field as Ghana and Japan! 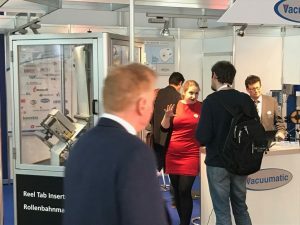 They were able to view our range of machines including Vicount 3 Disc paper counting machine, Mini TCF card counting machine and our Count-S optical counting machine. The machines were demonstrated counting not only security papers but also credit cards, tax stamps and passport materials. 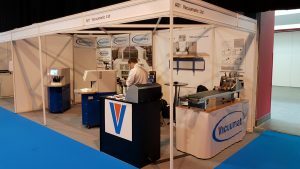 Our Vicount 3 Pin & Blade counting machine is being demonstrated on stand E10-082 until 12 May. We would very much like to welcome you on the stand! 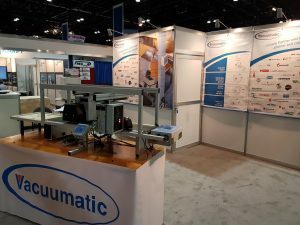 We are currently exhibiting at the ICE USA show in Orlando Florida through to 27th April, where we are demonstrating our market leading web marking machine the RTIS 3. Come and see the the RTIS 3 print on labels and attach them to a moving web. This machine can operate at speeds of up to 600m/min with no physical contact and therefore no risk of damage to the web or injury to an operator. If you are visiting the show, why not come and see us, we would be more than happy to show you this great machine! You can find us on Stand number 831. If you would like further information on our RTIS 3 you can contact us by either calling our German Office on Tel: +49 281 33995-0 or email info@vacuumatic.de or via our RTIS 3 Request a Quote on our website. If you would like any further information on the rest of our product range please call our UK Office on Tel: +44 1206 841100 or, again, via a Request a Quote on our website. 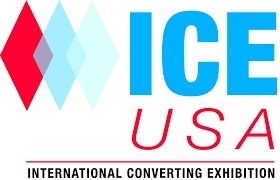 We will be exhibiting at the ICE USA show in Orlando Florida from April 25th to 27th, where we will be demonstrating our market leading web marking machine the RTIS 3. The RTIS 3 can attach a label to the web at speeds of up to 600m/min with no physical contact and therefore no risk of damage to the web or injury to an operator. You can find us on Stand number 831. If you would like further information on our RTIS 3 or any of our product range you can contact us by either calling our German Office on Tel: +49 281 33995-0 or email info@vacuumatic.de or via our RTIS 3 Request a Quote. If you are visiting the show, why not come and see us, we would be more than happy to show you this great machine! Would you like to see our machines before you buy? Did you know that we have a machine demonstration area within our factory in Colchester? We have demonstration models of the majority of our range. If you have an interest in any of our machines, we would be happy to demonstrate the machine to show you just how good it is! 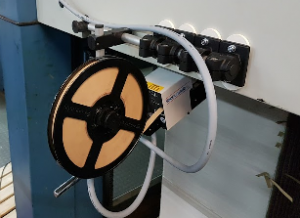 We currently have our Vicount 3 Pin and Blade Bench Top model, Vicount 3 Disc Small Floor Standing model, Thickness Compensating Feeder (TCF), Mini TCF, Count-S optical counter, VUTI 2 Tab inserter system, CUTI 2 tab inserter and our Mini Tab Inserter (MTI). We can even travel to you to demonstrate some of our products. The Vicount 3 Pin and Blade Bench Top model, TCF, Mini TCF, VUTI 2, CUTI 2 and MTI Tab inserters are all available for us to bring to you. If you would like to visit us or you would like us to pay you a visit for a demonstration of any of our available machines, then please use the ‘Contact us’ tab and send an e-mail with your request. We will be delighted to hear from you. 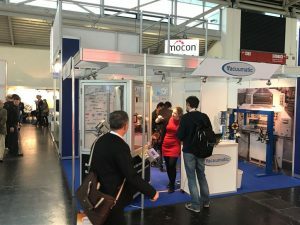 Our German team are currently exhibiting at the ICE Europe show in Munich. They are demonstrating our market leading web marking machine the RTIS 3. The RTIS 3 can attach a label to the web at speeds of up to 600m/min with no physical contact and therefore no risk of damage to the web. Our magnetic mounting kit, launched in 2016, has been a great hit with one of our customers in Morocco. This versatile kit allows for the positioning of, in this case, our VUTI2 tab inserter and our Electronic Count Controller (ECC) onto the parent machine, without invasive engineering for mounting brackets. 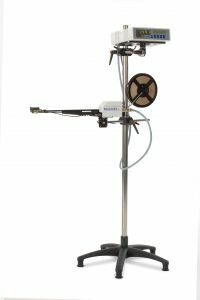 The magnetic mounting kit also allows for the option of easy re-positioning of either unit by the customer if required. Happy New Year. 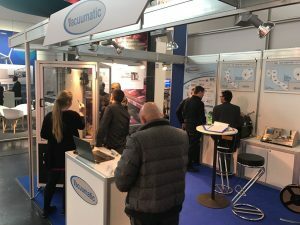 Vacuumatic will be attending the following trade shows worldwide during the first half of this year and would be happy to meet with you and discuss your commercial counting, security counting or tabbing and marking requirements. Alternatively, following a few exciting updates to our website you can get in touch by filling in a simple Request a Quote form on each product page. Other new features on the site include making the website more mobile-friendly, self-loading videos on product pages, a brochures download area where the brochures are listed by language and a video feed page where you can find all of our product videos in one place. With the launch of the new polymer five pound note this month, Vacuumatic are pleased to announce their involvement in the production process of this innovative new bank note. Vacuumatic has been involved from the start working with the printers of the polymer bank notes, who are De La Rue, based at the Bank of England site in Loughton in Essex. 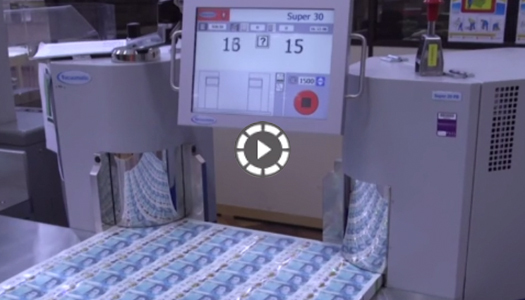 When De la Rue undertook the initial trials on the new polymer five pound notes, Vacuumatic proved they could count this new material reliably and accurately on the Vacuumatic Super 30 Pin & Blade Twin head counter. 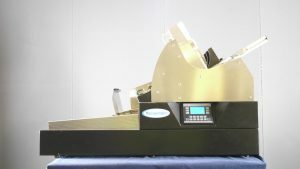 Vacuumatic’s machines were used in the production process verifying the stacks of notes in large sheet format, counting 2 corners at a time as a security check before they were cut down to the finished size, as shown on the video. 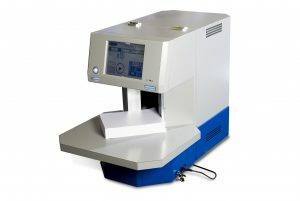 The Colchester company has been involved with Polymer Bank Notes since their introduction in the 90’s in Australia, and have supplied bank note counting machines to Innovia the substrate manufacturer and to other bank note printers who’ve been producing polymer bank notes for many years.